But here on the blog I’ve been surprised that readers say they’ve never seen nor heard of the Bois d’Arc tree. (pronounced bō-ˌdä(r)k). They pretty much grow wild here and we have these trees scattered throughout our property. I love ’em, so I thought I’d write a little about these magnificent trees and how they’re used. 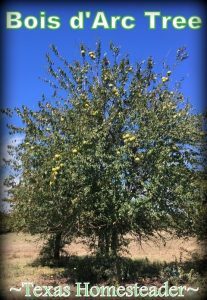 When I was growing up we called them Horse-Apple Trees, but they’re also known as Osage Orange or Hedge Apple. 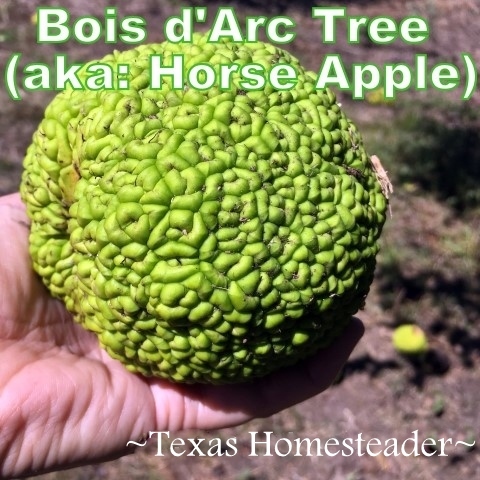 The Bois D’arc tree has many common names including Osage Orange, horse apple, hedge apple and more. 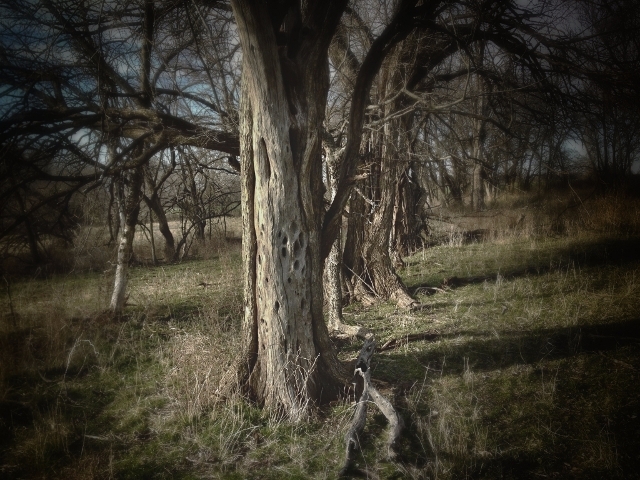 This is the tree that native Americans, especially the Osage Indians, preferred for their bows and arrows. This tree was described by French explorers as “Bois D’arc” which means bow wood. Different parts of this tree are used as insect repellent, leather tannin, fence posts, wheel rims, tool handles, etc. The list goes on and on, but the old barns and fences built using this wood are so sturdy, practical and lovely. Bois D’Arc Is Rock-Solid Building Material! All I know is that I love these trees. Our old barn was built in the 1880’s and the heavy posts that hold it up are made of Bois d’Arc. When we bought this property the barn was in sad shape. So we hired a contractor to repair it. We had them leave the interior intact and only rebuild the outer skeleton & replace the rotting exterior boards. But even though the barn is over 100 years old the contractors could not nail through the Bois d’Arc posts because they were so dense. They had to first drill them, and then nail or screw the boards to them. Fascinating! 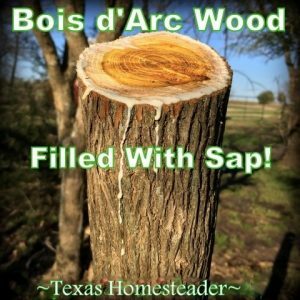 I think that’s because in addition to being a very dense wood, Bois d’arc is also saturated with lots of sap. We cut a smaller tree recently because it was in a bad location & our daughter needed one for her handmade save-the-date notices for her wedding. Just look at that sap! And I know that settlers used the living trees as part of their fence lines because of their strength and longevity. There’s a place on the back of our property where this is still evident. Isn’t that old Bois d’Arc wood gorgeous?? Ranchers around here still love to use Bois d’Arc trunks & limbs in their barbed-wire fences. Whether built into sturdy anchoring corners or used as natural t-posts, you’ll see Bois d’Arc in many local fences around here. That wood is so dense & rot resistant that it’ll do a fine job holding up that fence for decades. You can’t beat that! And I love how beautiful the wood itself is, especially as it ages. Such a gorgeous texture & patina. I enjoy using some of the smaller pieces decoratively. 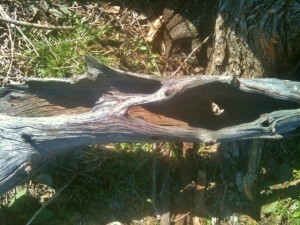 I’ve got several pieces of very old Bois d’Arc wood that are used as decorative pieces in my landscaping. 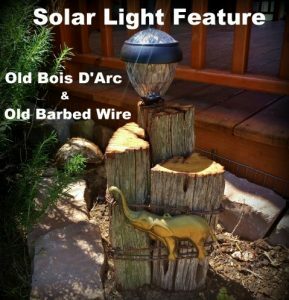 And when we needed a personalized gift for our daughter, we made a Solar Light Feature out of a very old, weathered Bois d’Arc post. It turned out perfectly and our daughter loved it! And even though this post was decades old, when we cut into the wood it was STILL yellow! Fascinating. This is some dense wood for sure! But to me, one of the most fascinating features of the Bois d’Arc tree are these odd orbs that the trees produce. As I mentioned, when we were kids we called ’em Horse Apples. They almost look like they belong in outer space do they not?? They’re very heavy & dense with a milky inside. Many old-timers swear by their bug-deterrent abilities. Back in the day they would toss them beneath the boards of their outhouses to keep spiders at bay. Many still toss them beneath their pier-n-beam houses or beneath sheds as a natural bug repellent. I’m not sure how effective it really is but I’ve heard it all my life and as I said, many old-timers still practice it. Others like to use the heavy orbs decoratively. Some will make them into a pomander and others will cut and dry them for various decorative purposes. I’ve seen some cut into slices and dried to make cute southern Christmas-Tree ornaments. Personally I like to harvest them and place them in a footed bowl just because I think they look so cool! RancherMan & I use our vintage cast-iron fireplace to supplement the heat in our home. We have a highly energy efficient dual-fuel heat pump. But of course living out here we have lots of wood at our disposal too. And c’mon, for me at least nothing beats the comfort of a warm fire on a cold day. 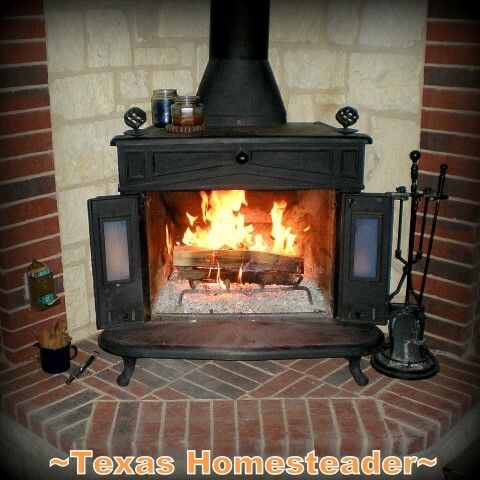 Keeping that fireplace going means less purchased fuel for heat. And it also keeps dead trees cleaned up from our property. So for those of you who have never heard of a Bois d’Arc tree, there ya go. It’s one of my favorite trees here on the Homestead. Heck, a beautiful tree sporting hard-as-iron wood and outer-space looking orbs – so many delights! 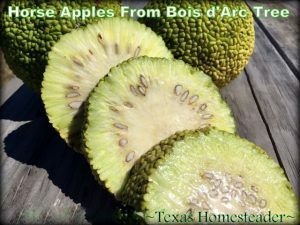 This entry was posted in Blog Posts and tagged Barn, Native Plants & Wildlife on August 2, 2018 by Texas Homesteader. I am new to Texas Bois D’Arc trees and scorpions … I have both in my yard and the scorpions making themselves to home whenever I leave the door open to enjoy the breeze. Do the “oranges” really repel scorpions? I could surely place a few around the outside doors if it will work. Thanks! We have osage orange trees here in south central illinois; i haven’t seen many of them naturalized in the forested areas around our local rivers, but they grow like weeds in the windbreaks and around the edges of the old farms. I always try to spend a couple of fall days hunting down a few horse apples for my fall decor! I enjoyed your story on the Bois D’arc trees I have never heard of these trees until I started following your blog. That honey locust must be the one with the gnarly inch or two inch long thorns. I wouldn’t want to run into those on an innocent hike. I throw horse apples under my decks to repel scorpions. You make me miss Texas. I have had a fondness for horse Apple trees since I was a kid. I didn’t learn their real name until I was grown. Thanks for sharing. I enjoyed the memories. When ever we were in Ohio visiting the Birdman’s parents we always stopped at a home/garden/bookstore place that was a heritage site (I think) I had to have a couple of new/used paperback books for the trip back. One year there was a pile of the Osage Oranges free to take so I brought one home and had it on the kitchen window sill for a long time. It shriveled and was a dark color and hard as a rock. It’s off the sill now but in a bowl elsewhere in the house. So many interesting things that exist in this world. I grew up in SE Texas and don’t remember ever seeing these trees, but went to visit my sister(she lives east of Dallas) and saw them. I was very intrigued by them. So, I did some research. I love the varied names of the tree, the crazy “apples” and that the wood is so wonderful. Thanks for sharing this and reminding me of that wonderful tree.